And a cheeks for free. A sour MVP for Carl English at game 9. Carl's MVP came after a 30 point and a total 33 league value. His efficiency, 3/6 at 2p, 5/7 at 3p and 9/10 FT, including 4 rebounds, 2 assists and 7 fouls received versus Manresa. It all makes a shared MVP against the other rough guys of the League. 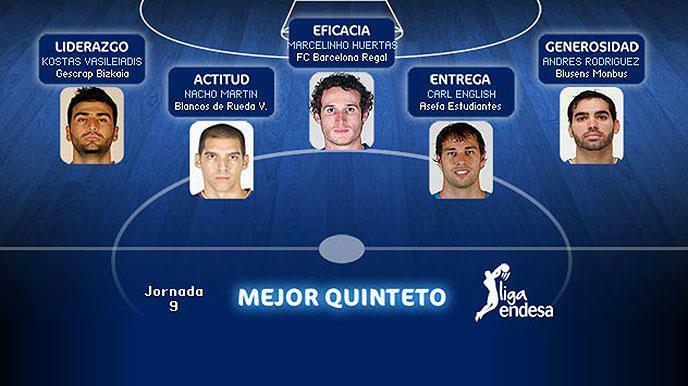 Only Marcelinho Huertas matched his figures although he calls it deception. CLUBESTUDIANTES.COM.- ”I have done what I could do to help the team, it doesn't matter at all because we lost”. Statistically speaking Carl English had the best figures although Captain Canada pointed out the fact that one's scoring mood did not help the rest of the team to avoid defeat. So it means "we all loose". English lessons: Assignia Manresa hadn't had a win along the season but they were amazing today, a very hard court to win in. The team had problems at defending, the swaps and the one on one, so Manresa took it for granted. We know the result today. Asefa Estudiantes will start working towards the best possible outcome. Two games as local against Blusens Monbus and arch-enemies Real Madrid CF. After Tariq Kirksay's one-two at the ideal quintet of Liga Endesa during games 1 - 2, Carl English's enthousiasm against Manresa rewarded him at the golden five. 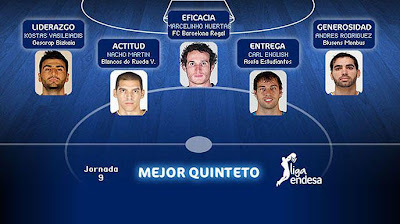 The rest of the squad, where commitment, efficiency and other team values are prized is Marcelinho Huertas, Andrés Rodríguez, Kostas Vasileiadis and Nacho Martín.